Reviewing a book, which describes a project you were involved in for seven years, is a bit like reviewing one of your own books. You are naturally going to be biased in favour of it and most of your readers are going to think you are in favour of it even if you are being objective. 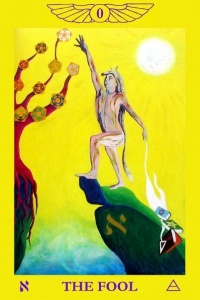 However A SEPHIROTHIC ODYSSEY: A Journey in Consciousness with the Golden Dawn Temple Tarot by Harry and Nicola Wendrich [click on the link to buy it] is important for anyone following the Golden Dawn system and Tarot in particular, so am going to have a stab at it. For those who came in late, Harry, Nicola and I were involved in creating the Golden Dawn Temple Tarot. When I say I was involved, my influence extended to ideas and a desire to keep the keys in line with the Golden Dawn “Book T,” Harry, as the artist, worked hard to incorporate my ideas and his own research into the deck. His wife, Nicola, worked on the minor keys. For Harry and Nicola creating the Tarot was part of a seven-year transformative experience. The Tarot images came through them and inspired them to paint. Central to that work was the colour system of the Golden Dawn, later this became important when Harry started building a vault for the Nottingham Temple of the HOGD. In my view these two experiences created a similar experience in Harry that I had also seen in Chic and Tabatha Cicero. They become that raw species of magician – a master of colour. Artists are supposed to understand colour, but few can work out its magical and transformational aspects. Harry, Nicola and the Cicero’s do, and this reflects through the work they created. It was what made the Golden Dawn Temple deck truly magical. Sephirothic Odyssey captures the intellectual and magical processes that Nicola and Harry went through when creating the Golden Dawn Temple deck. The book describes the images of the deck and the paths and sephiroth attributed to them. But this book is not just repeating standard Golden Dawn teaching. It features Harry and Nichola’s own ideas and responses to the symbols. Those who use Tarot for divination over a long period will find that the meanings they associate with each card slowly develop their own meaning. This meaning is part of their own understanding, but also reflects their spiritual path. Just imagine then the effect that creating your own cards, using symbols built on your own mediation on the traditional Golden Dawn system would have on that meaning. The key to harmonise the two ideas, I felt was to make the child a little older (seven years because that represents the completion first cycle of a human life) and make him wear the wolf-skin so that the instincts and the intellect where made into something useful for the lower self to wear. The knapsack became the knowledge papers of the outer and second order, which had been discarded because the Fool had finished his studies and the knowledge was a part of him. Like in the Whare Ra deck he reaches for more fruit, even if it means starting over from his new position (foolishly falling to start over). Harry then worked his magic on that outline and we ended up with something much more. The Fool becomes more definite. He is not accidently falling, he is striding to the edge of the cliff with a childlike fearlessness. He is reaching for the highest fruit (Kether). In addition to the books there is an outer order sash which represents the superficiality that intellectual understanding of the Golden Dawn system appears to confer. In Sephirothic Odyssey Harry writes that the wolf-skin gave the Fool a shamanic energy indicating that the Fool has acquired a sixth sense, an natural faculty of the wolf kingdom. “The wolf-skin is invisibly connected to the serpent of desire that pulls against a spiritual long. It represents the flesh or the animal self, which is no long a focal point,” Harry writes. The symbols on the fruit are the geometric shapes connected to the spheres and the one he is reaching for is connected to the Ace of Wands. Harry and Nicola show that the Tarot has become the teacher and some of the gems in this book really do shine. Another important part of this book is Harry and Nicola’s development of colour theory. Superficially this differs from the Golden Dawn theory by being more specific in the definition of primary colours. The Golden Dawn was limited in its use of colour by the technology available in 1888 and so primary colours (ie colours which cannot be created by mixing) were set as Blue, Red, and Yellow. Pigment technology finally settled on the true primaries, which were Cadmium Red (in 1909), Cyan Blue (in 1935) and Quinacridone Magenta (in 1970). While this does not change the planetary colours (mars remains scarlet) it tints some of the colours of the Sephiroth and the paths. This book carries fascinating information on this process and what it means. It is based on the ideas of Don Juskco, but Harry and Nicola explain the process in Golden Dawn terms. Around the same time that Harry was working on the Tarot he was also getting information on Serpent Power which has worked its way into this book. In my view this adds to the Tarot revelation and shows the new directions in which Tarot can take you. Other ideas contained in this book you will either agree or disagree with. It does not matter really. Harry and Nicola are showing you their magical world based on art and magic. Owning this book certainly does help you unlock the mysteries of the Tarot, which are part of the Golden Dawn Temple Tarot and no doubt your response to those symbols, and colour will take you on your own Sephirothic Odyssey. That is the thing about Odysseys – they do not end. 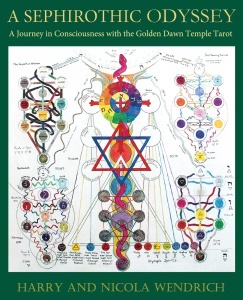 The Golden Dawn Temple Deck takes you on a magical Odyssey and this book provides you with a description by those who intimately navigated it. I would rank this as a vital book for anyone using Golden Dawn Tarot, or anyone interested in magical tarot generally.